Mckfresh Nail Attire is an Aussie indie brand that I recently tried for the first time with a polish in the July What's Indie Box. I recently was sent the latest Mckfresh collection, called Spring Dreaming and there are some really pretty polishes in there. It's so nice to have some seasonal collections available for us southern hemisphere gals. Not that I usually stick to seasonal trends, but when the weather instantly turns warm and the trees are blossoming (like it has in the last week), then wearing brights and pastels is what you feel like doing. There are seven polishes in the collection, and today I'm showing you the four cremes and shimmers and tomorrow I'll show the remaining three glitters. First Light - a bright almost neon pink leaning orange. It's so much brighter than my photos capture because neons are always notoriously hard to photograph. This one is most definitely a jelly finish but it achieves opacity quite easily. 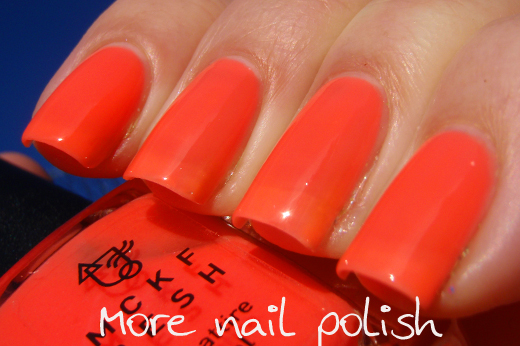 The formula is beautiful for a neon polish. This is three coats with Seche Vite. Lakeside sunset - a soft lavender purple with a pink shimmer. Formula was great and the polish was easy to apply. This is three coats with Seche Vite top coat. Morning Dew - a soft mint green with strong silvery green shimmer. Perfect spring shade and the shimmer is amazing. This is two coats with SecheVite. Splice of Life - a very pale yellow creme polish with a coppery pink shimmer. I needed four coats of this one to ensure it wasn't streaky, but the end result was really pretty. The shimmer in this polish is so sparkly, it's actually makes you nails look wet. This is four coats with Seche Vite. Wow, I really liked that orange jelly! Love the shimmer in Lakeside sunset! Ohh first light is beautiful. It reminds me of a jelly bean! That purple is so sweet!